There is no correct sorting of Sanskrit words in MS Excel 2007. I was looking for it for years. Sample file for sorting can be downloaded here. Old books have correct sorting. New files have none. Why? Because nobody cares. play two roles thus we need two distinct characters in the sort table. Shorter words should come first, see screenshot. So no, Google Docs are as miserable as MS Office. See .pdf page 24, 25, 27, 29. Is totally wrong as well. Every Sanskrit phoneme is represented as an integer between 1 (a) and 49 (h). 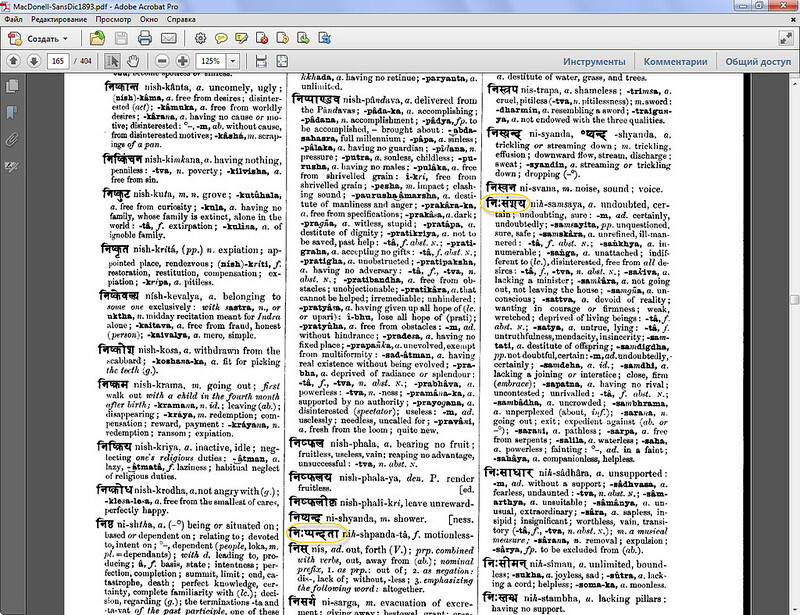 A word is a list of phonemes. Words are thus sorted by lexicographic ordering over lists of integers. Homophony indexes are suffix codes, from 50 to 59. My methodology is very simple. I have designed a toolkit Zen for computational linguistics based on very simple notions, and Sanskrit is just an application of these generic techniques. The whole Zen toolkit may be downloaded as open source software from a URL given at section Zen on my site entry page. A pdf manual documents the library. http://icebearsoft.euweb.cz/download/zwxindy.pdf – best documentation on Nāgarī, which is called ‘Varṇamālā’ (वर्णमाला). It is also called ‘kakaharā’ (ककहरा) or ‘Akṣharamālā’ (अक्षरमाला; Akshar-mala)! Varṇa means letter; mālā means chain or garland. # Every line describes one letter of the alphabet (in all its variants). # should be no problem. # appear which differ only in the diacritical variant of this letter. # ISO-8859-1 character set. In this case we just leave it out. # mixing alphabets of different languages. # The same with /, only this time with uppercase/lowercase variants. # The order of the lines in $ligatures does not matter. # first lower or upper case?